After years of stream restoration, the Maryland Department of Natural Resources recently discovered native brook trout returning to once uninhabitable streams. Partnering with the Maryland Department of the Environment and the Youghiogheny River Watershed Association, crews have been working diligently over the past few decades to restore the Casselman River watershed in Garrett County. The watershed suffered from nearly a half century of chemical pollutants from area abandoned coal mines, which nearly wiped out the brook trout populations in some Casselman River tributary streams. To restore the 66-square mile watershed back to a nearly pristine condition, crews scoped out 15 sites for the project. Limestone treatment systems were built to enhance and improve water quality. In late summer, the department’s freshwater biologists sampled several streams in the Casselman River watershed and discovered incredible results. Several streams within Savage River State Forest that were once fishless due to acidic conditions now support naturally reproducing brook trout populations. For example, Alexander Run, Tarkiln Run, and the upper reaches of Big Laurel Run, all once fishless, now support native brook trout populations exceeding 1,000 trout per mile. “The goal of increasing brook trout densities has been realized and has also increased brook trout fishing opportunities in Maryland,” Western Region Fisheries Manager Alan Klotz said. 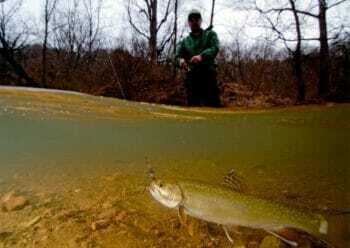 The state will continue stream restoration and monitoring of native brook trout populations projects in the area.